Hi there my friends, how is everything today. Have all of you in the US survived the horrid cold snap! Sure hope you are all staying nice and warm. 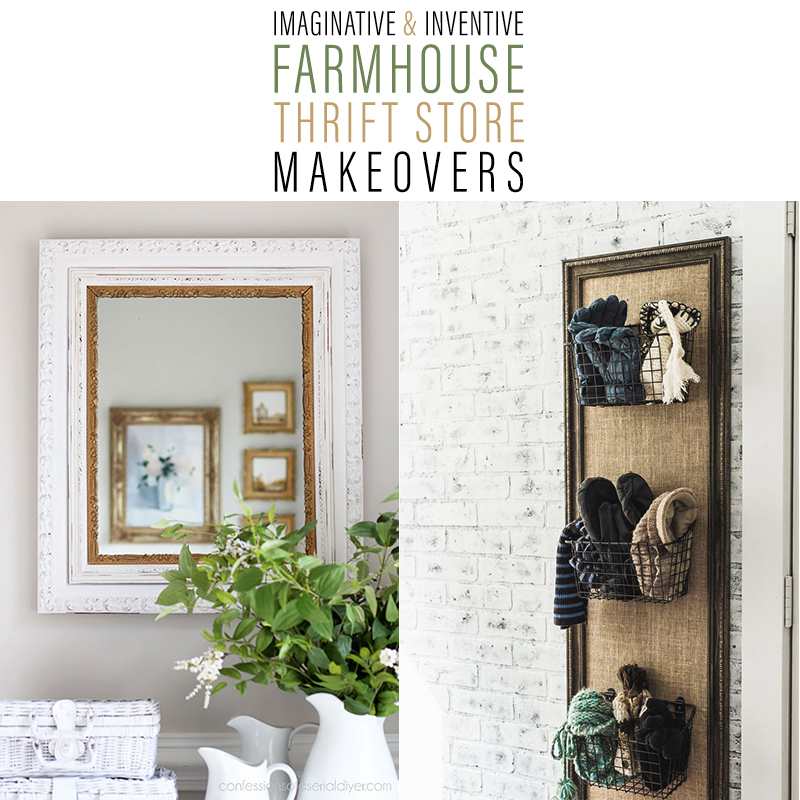 Well time flied and it is once again time for some Imaginative and Inventive Farmhouse Thrift Store Makeovers. This weeks selection is so much fun and each and every piece will fit in just about anyone’s Home Decor. You will find a Fabulous Succulent Garden … Industrial Farmhouse Wall Art… a Coat Rack that is simply amazing and so much more. Now is the time that you sneak off to the most comfy space in the house with your delicious cup of brew and get tons of inspiration for your next Thrift Store Collection. 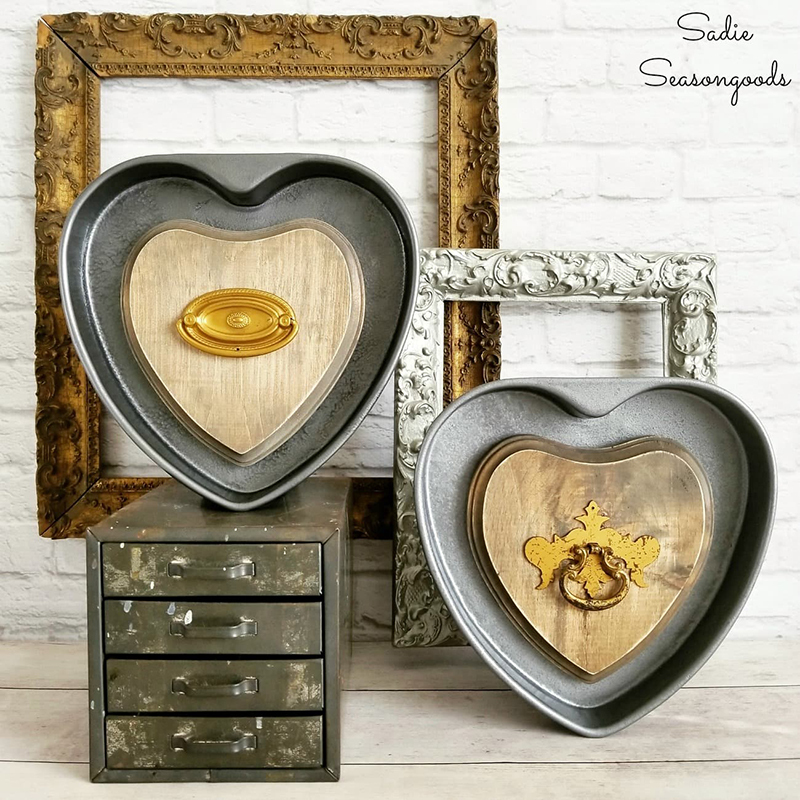 What would you do with Thrift Store Heart Pans? Make a cake…maybe a 2 Tiered Tray? Well our creative friend Sarah from Sadie Seasongoods decided to make Industrial Farmhouse Wall Art an it looks awesome. Tins… wooden hearts and some Thrifted hardware and viola. 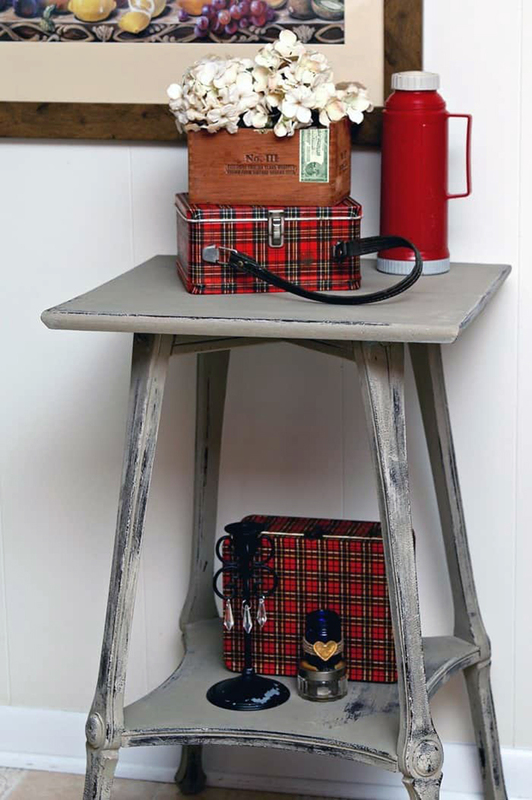 Sara used them in this stylish Farmhouse Vignette… but there are 1000+1 other uses. Just use your imagination and have fun. When you drop by Larissa’s place… aka… Prodigal Pieces you are going to see how she took a majorly dated piece and I mean totally dated… something many would pass up… but not Larissa. She proceeded to transform it into an incredible Farmhouse Coat Rack you are going to fall in love with. Come join her as she shows you step by step and there is even a Video DIY! Don’t miss it and think twice as you walk away from something you might think is hopeless but it’s not. Just needs a little bit of love… imagination and usually a lot of paint : ) ENJOY! 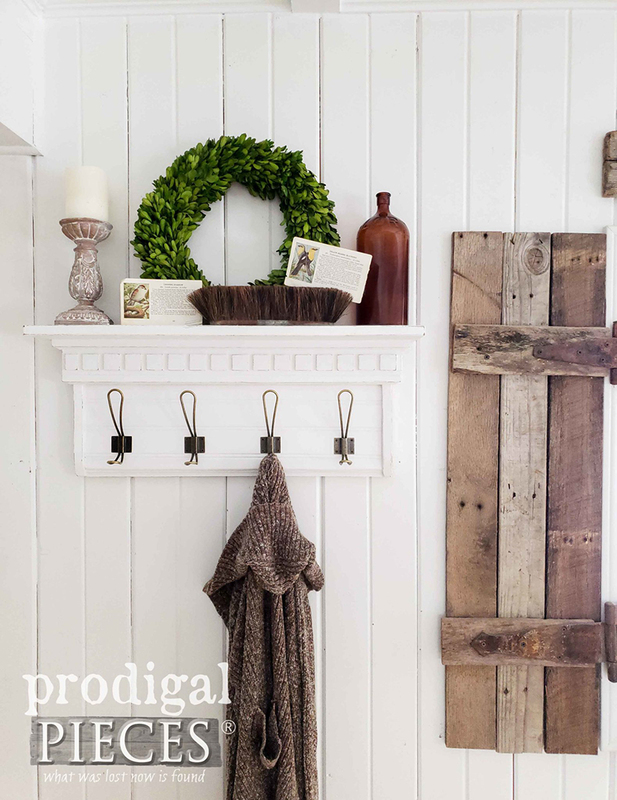 I bet you can think of a million and one ways to use a Thrift Store Frame… but have you thought of making a Mudroom Organizer with a Farmhouse Flair? Well Hayden and Greg over at The Navage Patch did, and they are sharing their DIY with us. 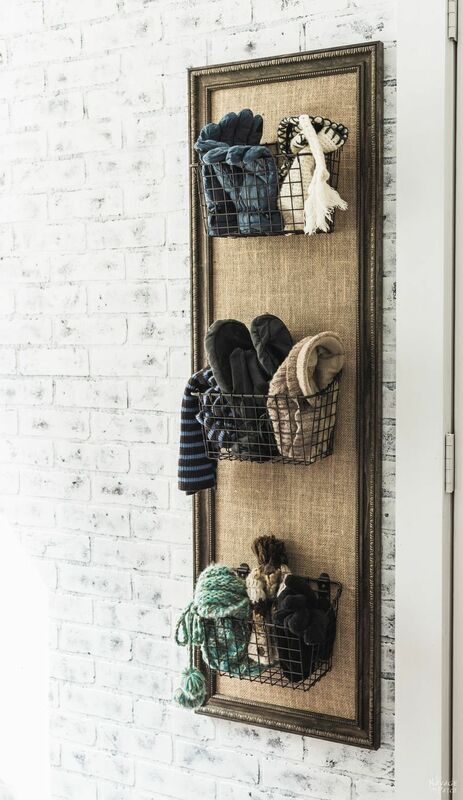 Come and see how they cover board with Burlap… place in frame and then add baskets. You can do this with all sorts of frames… add the finished piece or two or three to your Mudroom for fabulous Organization and a great look. Now it’s time to hop on over and visit with The Girl In The Garage. 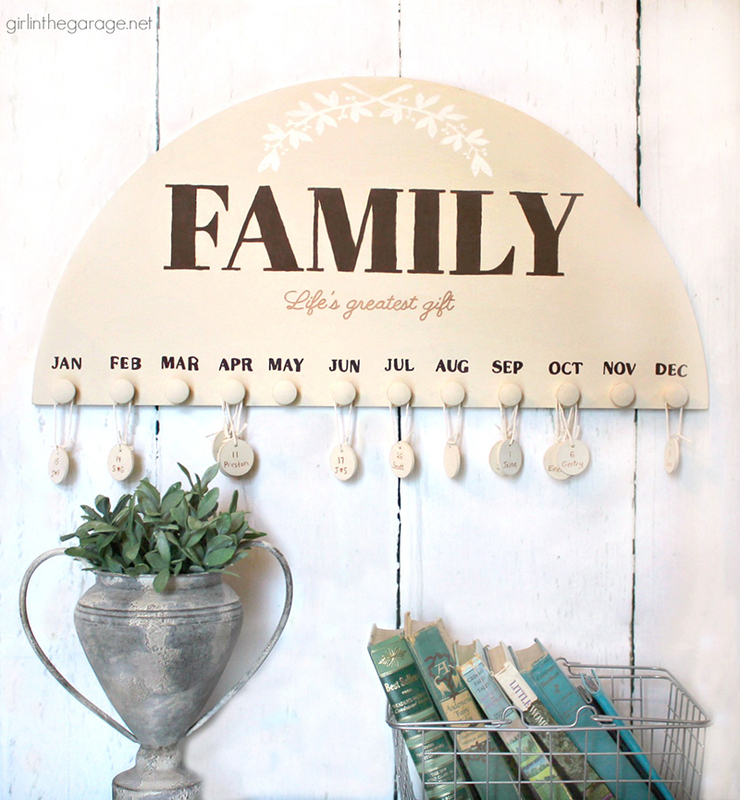 She is going to transform dated piece of Thrift Store Art into a Fabulous DIY Family Birthday Calendar and it is a sensational piece to have. Never forget a birthday again. Time to pay Christy over at Confessions Of A Serial DIYER a visit. 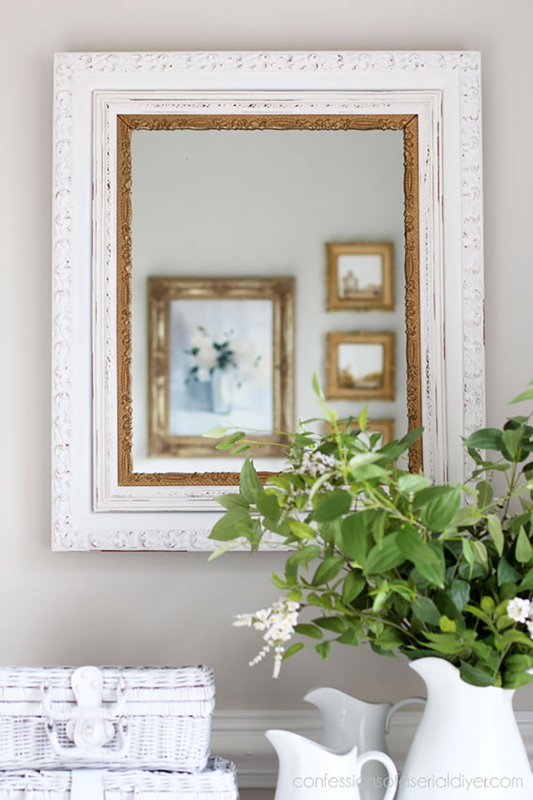 She is showing us yet another way to give a Thrift Store Frame a marvelous Makeover. You have to see the technique she used… pretty awesome! Kathy from Petticoat Junktion is going to show you how to take a small Wooden Thrifted Table and give it a great distressed Farmhouse look without sanding! Interested? You can check out her technique and keep it in you back pocket for many Farmhouse Thrift Store Makeovers to come. 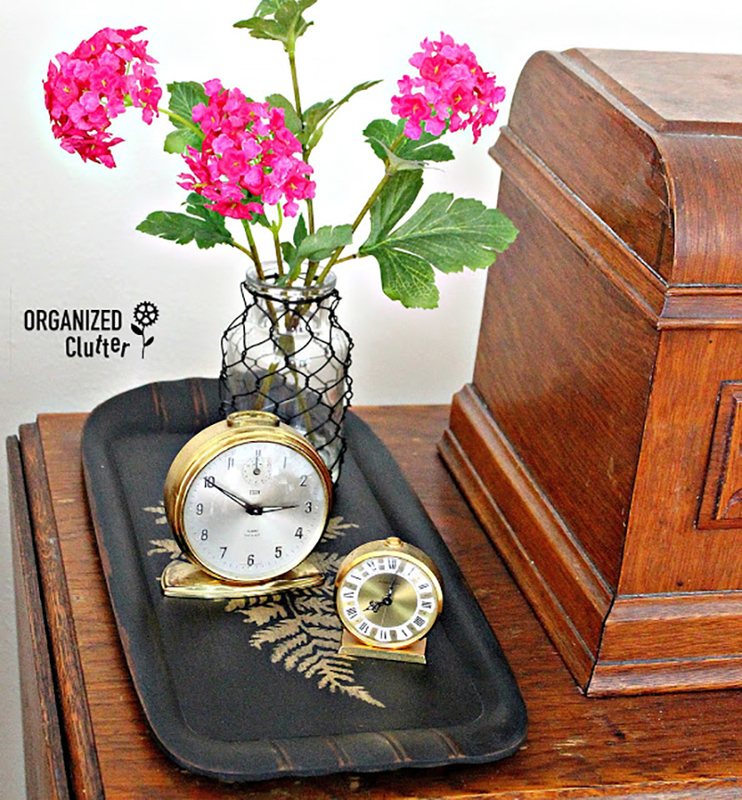 Here we are at Organized Clutter where Carlene is going to show us how she made over 2 little trays and then created a Farmhouse Vignette with a touch of glam! 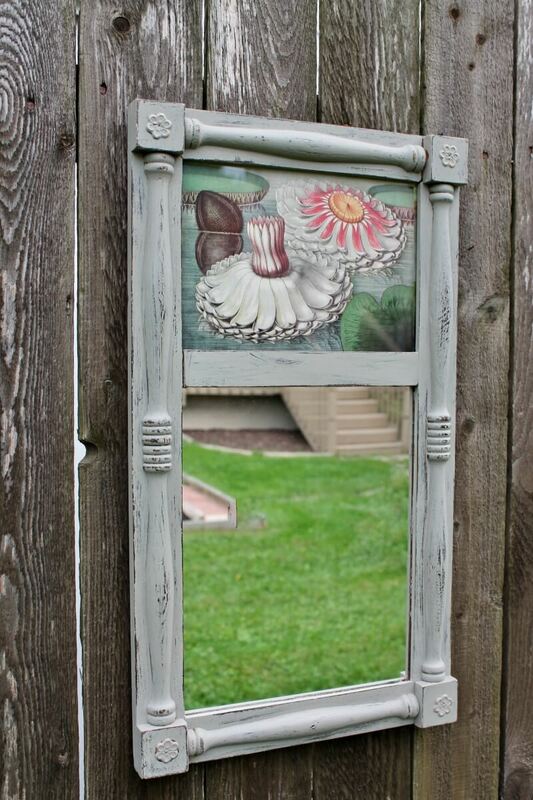 Come and see how Diana from Adirondack Girl @ Heart transformed and Ugly Mirror (her words not mine) with the Magic of Chalk Paint! Not much that fabulous paint can’t do. I am constantly amazed what a little bit of paint can do. 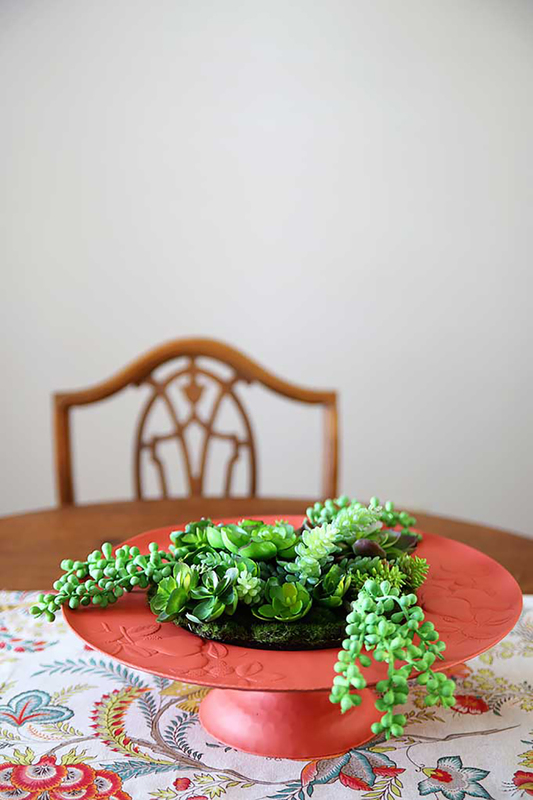 See how the House Of Hawthornes repurposed a Thrift Store Tray into a delightful Faux Succulent Garden with Modern Farmhouse and Boho Style. What a great way to add a POP of color into a space. What would you do with a Thrifted kitchen table that was just dying for a makeover??? Well Lauren from Bless’er House would answer that question …I would make the most fabulous Farmhouse Desks of course. How much do you love these? Check out this DIY…it is one you just might use someday soon. 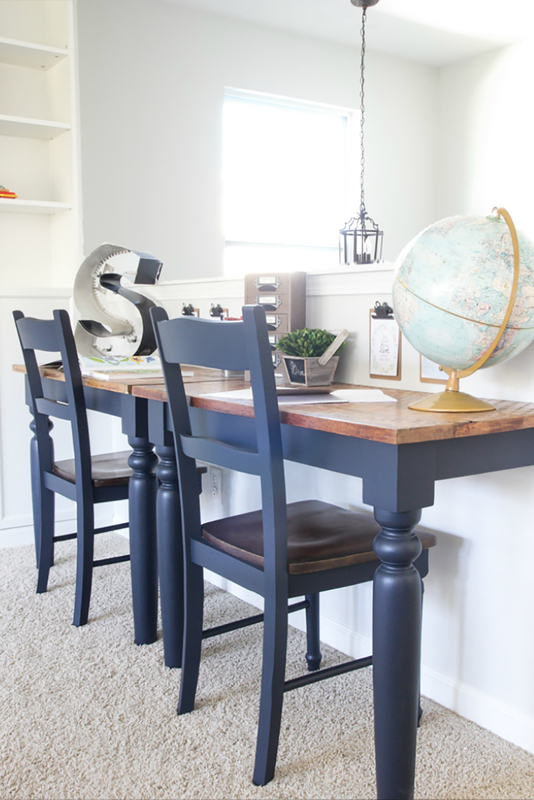 Keep your eyes peeled for the right kitchen table for your home and style. LOVE IT…also love the color. That burlap mitten holder is really cute Andrea! Hi Diana! I LOVE putting a smile on your face my friend!!! Sending tons of hugs and wishes for a wonderful week! Andrea, love the flea market makeovers. Such a wealth of creativity. A group of 12 bloggers just did a flea market makeover blog hop so there were some great ideas there if you would like to check it out.